Last year, the husband and I decided to take a 2 week long trip to Italy. The last time we were in Italy, was in Venice back in 2007. It was also the first country we took a trip to as a couple, so it was definitely time to return to country famous for their food, wine, great art, Gelato, culture and history, the list is endless. We have been to Italy a few times before. First was when we rented a lovely villa in Tuscany for a week and drove around to explore the area. The next was a short weekend trip to Venice. We thought this trip, we would explore more in depth. 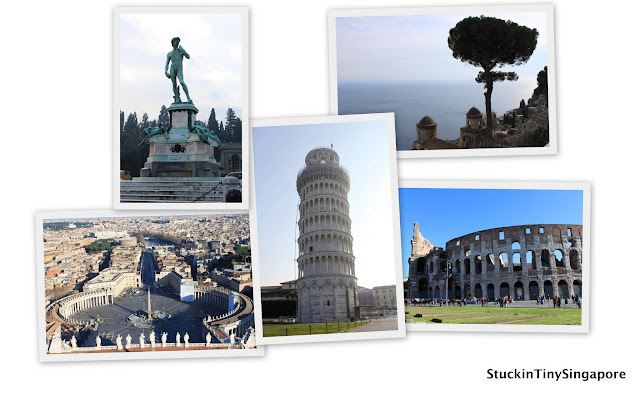 We selected all the places that Italy is famous for and then checked if we could fit them all in 2 weeks. On our bucket list was Amalfi Coast, well-known for her spectacular coastline to Pompeii for her historical ruins to Rome, the capital city that contains everything that would bring a historical buff (the husband) to his knees. It was not an easy feat, we had to trim and adjust our travel itinerary several times to fit what we wanted to visit in just 2 short weeks. Due to the husband work, we can never take more than 2 weeks of holidays at a go. 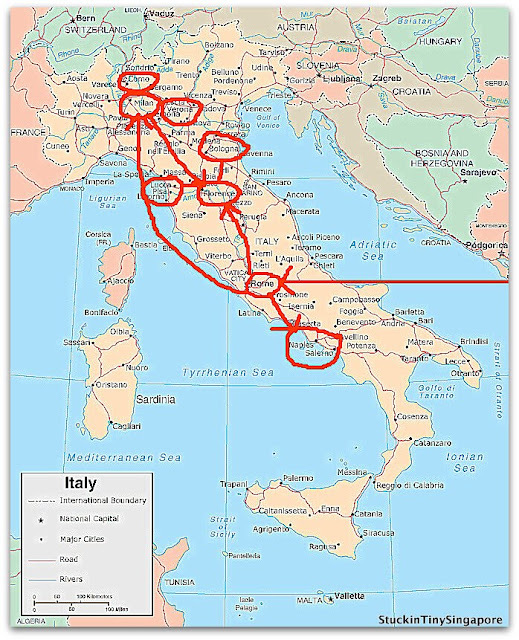 The map shows our journey across Italy. We got great bargain with Thai Airways on their business class to fly from Singapore via Bangkok to Rome where we went south to Sorrento, then back to Rome to explore. The next base was in Florence where we explored the cities nearby from Pisa and Lucca then to Bologna. Next we went North to Milan, where we spent a few days to go to Como and Verona before heading back to Rome to fly back to Singapore. We travelled the length and breadth of Italy using the Italian rail. We bought on Italy Rail pass using Rail Europe as even with credit card fees and exchange rates discrepancy, it was still cheaper to order via their website then go through a local sales agent. You can get special prices if you have 2 or more adults travelling together and they must travel together for all the time you use the rail pass together. Since we were travelling so much and quite a bit of our journey were long, the husband decided to splurge on first class rail travel. Bear in mind when using the rail pass that you have to make reservations for some of the trains especially on the high speed intercity rail. This can be easily done using self-service machines at all the major train stations in Italy. So stay tune. Ciao and Arrivederci.